Are you currently expecting and worried you’re gaining too much weight too quickly? Do you wonder if your prenatal vitamins could be contributing to your weight gain? It’s never too early to start taking care of your baby, and a prenatal vitamin will get you both off to a healthy start. But are there any risks associated with prenatal vitamins? Could they possibly cause weight gain or any other side effects? We will discuss why it’s important to take a prenatal vitamin and when you should start taking one. We’ll also consider whether they cause weight gain, and what to do if you’re experiencing sudden weight gain or other possible side effects from your prenatal vitamins. Why Take A Prenatal Vitamin? When Should I Start Taking Them? Will They Make Me Gain Weight? But Why The Sudden Weight Gain? Proper nutrition is important for you and your baby’s health. Your baby depends on you for all of their nutrition needs, and it’s likely your diet could be lacking in vitamins and minerals needed to support a healthy pregnancy. Taking a prenatal vitamin will fill those nutritional gaps essential for healthy fetal development. It’s even more important to take a prenatal vitamin if you have any dietary restrictions, health issues, or pregnancy complications (source). Reduced nausea: Vitamin B6 has been shown to reduce nausea associated with morning sickness. Women who use prenatal vitamins before conception tend to have less nausea in the first trimester than those who don’t. Fertility boost: Research proves that taking a prenatal vitamin boosts your chances of conceiving a healthy baby faster. Reduced risk of congenital disabilities: The biggest reason to take a prenatal vitamin is to ensure you get enough folic acid. Folic acid drastically reduces the risk of neural tube defects in your growing baby (source). While it’s true that supplementing with Vitamin B6 reduces nausea, prenatal vitamins do not have the same effect. Many women experience nausea after taking their vitamin due to the iron (source). Some mothers cut down on nausea by splitting their vitamin in half and taking it twice a day. Others prefer to take the vitamin after dinner. If you are absolutely unable to take typical prenatal vitamins, consider a gummy prenatal vitamin until your nausea subsides. However, switch to a conventional prenatal vitamin after the first trimester because gummy vitamins don’t have the iron your body and baby need. Can’t I Just Take A Multivitamin? Prenatal vitamins are specifically formulated to meet you and your growing baby’s nutritional needs, whereas a multivitamin will only meet the needs of your body. Pregnancy increases your daily intake requirement for vitamins and minerals to support proper fetal development. Prenatal vitamins typically provide higher doses of folic acid (folate or folate supplements) which help prevent neural tube defects. They also supply iron which prevents anemia and supports baby’s development, and calcium to support bone development. Most prenatal vitamins also contain DHA (docosahexaenoic acid) to support the development of the baby’s brain, eyes, and nervous system. Healthcare professionals recommend starting a prenatal vitamin three months before you conceive to prepare your body to grow a baby. However, we all know pregnancies aren’t always planned. So if you were just surprised with a positive pregnancy test, start taking a prenatal vitamin right away. There is no evidence that prenatal vitamins make you gain weight. Most pregnant women gain about 25-35 pounds throughout their pregnancy whether they use a prenatal vitamin or not. And since vitamins contain zero calories, the weight gain is likely just due to the pregnancy itself. The Iron in prenatal vitamins can cause constipation and bloating, making your clothes feel tighter. But no one can definitively proclaim them as causing you to gain weight. When experience constipation and bloating, I recommend that moms increase fiber and fluids, but if that’s not enough they can take docusate sodium. If you experience sudden weight gain at any point throughout your pregnancy, visit your doctor as soon as possible. If combined with a severe persistent headache, visual changes, or right upper abdominal pain, this could be a sign of preeclampsia (source). Preeclampsia is nothing to mess with. It can have severe effects for both you and your baby, such as low birth weight, miscarriage, stillbirth, seizures, and even maternal death. Bright yellow or green coloration in urine. However, most of these side effects are symptoms common with pregnancy, so it can be difficult to determine if it is truly the prenatal vitamin causing them. Talk with your healthcare provider about any side effects you may have from taking prenatal vitamins (source). 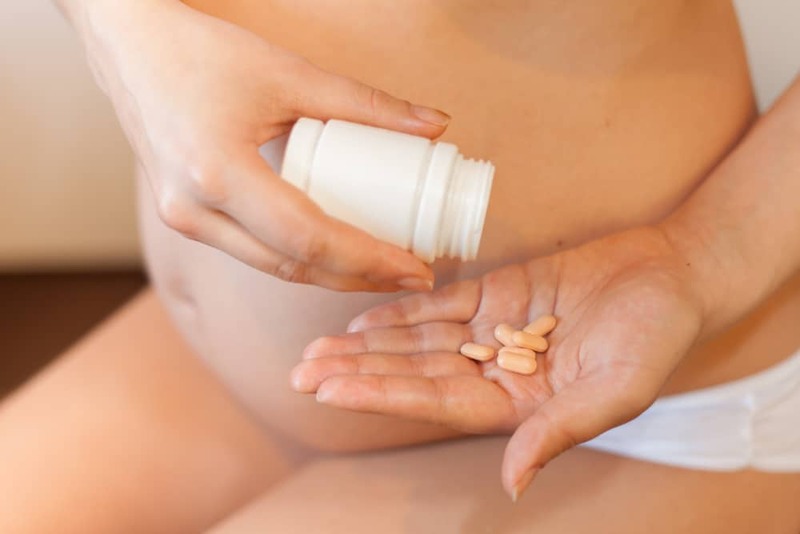 Taking a prenatal vitamin will support you and your baby’s health. They’ve even been shown to boost fertility, increase iron levels, and reduce the chances of birth defects. By taking a prenatal vitamin three months before planning to conceive, you will receive enough folic acid, calcium, and iron to support a growing baby. Although prenatal vitamins can cause constipation, bloating, and other minor side effects for some women, there is no proof they can cause weight gain. Because they contain zero calories, your weight gain is most likely just from the pregnancy itself. If you are experiencing sudden weight, contact your physician as soon as possible, as this can be a sign of serious pregnancy complications. Did you experience any side effects while taking prenatal vitamins or experience any abnormal weight gain during pregnancy? Share your experiences with us in the comments and be sure to share this post with your expecting mama friends.